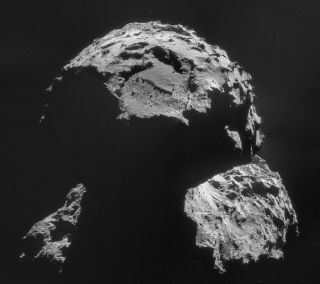 The Rosetta mission's view of Comet 67P/Churyumov-Gerasimenko on Nov. 6, 2014. Rosetta's Philae lander will attempt to land on the comet on Nov. 12, 2014. Landing a probe on a comet whizzing through deep space isn't easy, but this week, the European Space Agency (ESA) will attempt to do just that. If successful, it will be the first time a probe has landed on the surface of a comet.Officials working with ESA's Rosetta mission are planning to land the robotic Philae probe on Comet 67P/Churyumov-Gerasimenko's surface this Wednesday (Nov. 12). You can track Philae's historic progress in live webcasts from ESA and NASA starting Tuesday (Nov. 11) and throughout the day Wednesday. Officials on Earth should know if the landing went well by 11:02 a.m. EST (1602 GMT) on Nov. 12. The landing is a risky operation. It will take about 7 hours for scientists on Earth to find out if Philae's trip to the surface was successful. A NASA video has even dubbed that block of time "7 hours of terror," an homage to the NASA Curiosity rover's "7 minutes of terror" video that described the Mars rover's landing sequence. "This comet is very, very rough," Andreas Accomazzo, Rosetta operations manager at the European Space Agency, said in a Google+ Hangout Friday (Nov. 7). "But this is what we have, and this is what we are trying to do. We have to be a bit lucky as well." The two-part Rosetta spacecraft is designed to orbit and land on the Comet 67P/Churyumov-Gerasimenko in November 2014. See how the Rosetta spacecraft works in this Space.com infographic. If Philae's landing is successful, it will crown Rosetta's decade-long journey in space. The mission is doing the first orbit of a comet right now.Rosetta has already become the first spacecraft to orbit a comet, and if Philae safely touches down on Comet 67P/C-G, the lander will be the first to make a soft landing on a comet. A comet is a tough environment. The gravity is so low that Philae will need to deploy a harpoon into the surface in order to stay put on Comet 67P/C-G. During landing, the spacecraft will face a dusty environment — not to mention, rocks on the surface. Success will also largely depend on how well the probe's hardware and software perform during those final few hours on the way down. "We have 4 hours to put them together, check to verify they are consistent, uplink to the spacecraft ... and double-check they are OK to the spacecraft," Accomazzo said. "It's a pretty dense set of activities we have to do." The spacecraft is too far away for controllers to do anything but hold their collective breath as the probe makes its descent. ESA mission controllers should acquire a signal from Philae during its descent at about 5:53 a.m. EST (1053 GMT). Once that signal is established, Rosetta can start beaming back science information gathered by Philae on its way down to the comet's surface. And by about 11 a.m. EST (1600 GMT), scientists should know if Philae reached the surface. Rosetta will also need to make several maneuvers to stay in touch with Philae during its descent, landing and post-landing activities. ESA added that both Rosetta and Philae appear to be in good shape to date, so they are planning for the best. Even if Philae doesn't successfully land, ESA anticipates that only 20 percent of the scientific findings expected to be gathered from the Rosetta mission would be lost. The remaining science would come from the orbital mission, which is projected to remain active until at least December 2015 — five months past Comet 67P/C-G's closest approach to the sun. Philae's potential landing would make it the seventh location in which spacecraft have touched down outside Earth. The other bodies visited include Venus, the moon, Mars, Saturn's moon Titan, and asteroids 433 Eros and Itokawa. "It's a very, very risky business, but it's a business in which we have invested a lot of know-how — a lot of technical know-how, a lot of scientific know-how and a lot of cooperation," Jocelyne Landeau-Constantin, head of European Space Operations Centre communications, said in the same webcast. "Sometimes, we wake up and wonder if this dream is going to be true," she added. "Sometimes, we know it can go wrong. But we are ready for every option, and are still very confident we can make it."